Vice President & Manager U.S. Team Wells Fargo & Co.
Seid created a set of X-ray images. One image appears three times! (#10, #11 and #13 are identical). the time stamped on each image identifies it precisely. to produce for an out-of-plan doctor. printed out and then scanned! stamps on the images. I got the time stamps off a set of the paper printouts. thought there might be something interesting to be found. I was not disappointed. fact that she wasn't free to give an honest second opinion. CAN BAD DOCTORS CREATE GOOD KNOWLEDGE? show the study's possible application to modern hypothermia research. transfer to another doctor, [Dr. X] said anyone except Dr. Z". Editorial Support Manager: ... Clinical Practice & Research. See all posts re Lynette Seid. main computer, but the story has fallen apart. canceled it within a week. $10. I sent the money, but I didn't get the CD. the reason is the typical one at Kaiser: saving money by denying care. IMAGES HAD BEEN PRINTED OUT DURING THE PROCEDURE. digital images printed out on high quality paper. a great deal of trouble to conceal. Strangely, I was told by multiple individuals on April 7, 2014 that they had "still"
procedure on June 16, 2011. 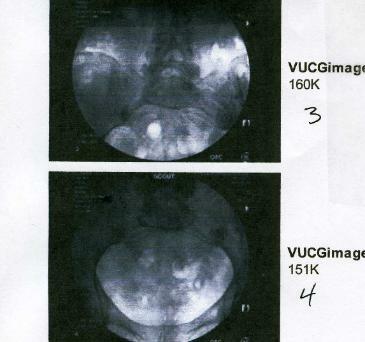 My VUCG procedure was on June 15, 2011.
still images dated June 16, 2011.
another desk and waited while a young woman named “V” sat down in his chair. V asked me, “What are you going to play the CD on? with it, including using it as a bookmark or a Frisbee. V asked me again, “What are you going to play the CD on? Van said there was no video. dropped open when she started talking about VHS tapes. Van went to get J.
phone numbers. Perhaps I was supposed to call out their names loudly? she said SR will call me. word, but I recorded most of the conversation. SR: Was your procedure done in urology department? watch it on fluoroscopy which is like a video camera which is not actually taped. not fully reported from beginning to end. Just spot pictures. ML: “Spot pictures” are X-ray on a film? ML: Do you have some films from my procedure? ML: Sometimes you do have plain film for people who have VUCGs? SR: Yes, because we do it a lot on babies. I can find out if there are plain films. ML: I’d like you to do that. ML: So there are never any digital videos for VUCGs? SR: For this particular exam, no. And that’s common practice, not just Kaiser. ML: You know what a VUCG is? SR: Yes, it’s a voiding urethrocystogram. ML: And you know for a fact that they don’t make digital videos of them? SR: I don’t even think they have the capability to do it. ML: This is the latest technology? SR: Correct. That’s common practice. ML: Can you find out if anybody gets digital videos for VUCGs? done her as well as in the outside community. It’s not a standard of care. ML: Can you find out? SR: If it’s done at urology? I would have to call urology. SR: I reached out to the chief of urology and confirmed that we do not tape. ML: Do they use thermal paper? used in mammography more than 20 years ago. ML: There were no digital images saved? SR: You used the word “video”. There was no taping. That is not procedure. ML: Are there digital images? SR: I don’t know if they would be digital. ML: Is there a possibility they might be digital? regular radiology, not necessarily in urology. Southern California, from L.A.
down, did start to convert to non-film images. ML: When you say “converting to non-film”, you mean digital? ML: Right now urology never uses digital X-rays or fluoroscopy? SR: Fluoroscopy and digital are different things. We do not use video cameras. ML: Fluoroscopy is never digital? ML: Sometimes fluoroscopy is recorded digitally? 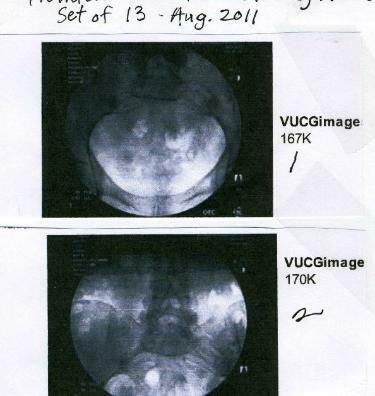 voiding urethrocystogram there is not recording of fluoroscopy. 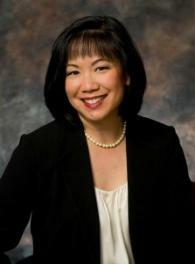 ML: You talked to Dr. Rhee? SR: Yes. I don’t want to mislead you. ML: You don’t want to mislead me? ML: You don’t want to mislead me, do you? SR: Mrs. Larkins, is there anything I can answer? ML: I want you to answer this: you don’t want to mislead me, do you? ML: They gave me her name, but not her number. SR: Are you asking me something? ML: I’m asking for her number. SR: 619 528 5527. Mary is on vacation. ML: What is her title? ML: Who is her supervisor? ML: What is her position? SR: Associate Medical Group Administrator. I don’t have her information. ML: There must be someone between her and Jim Malone. SR: Which is Jim Malone. ML: I bet sometimes you don’t like your job, do you? SR: I love my job. ML: Surely you don’t enjoy telling me these things? SR: I’m just telling you the truth. SR: Well, you have a wonderful afternoon. called but no person or machine picked up. believe you are beyond the legal limit for this request. contact the secretary at 528 5538” or the clerk at 619 528 5417.
too much help to patients. Are doctors the new lawyers? See conflicts of interest. committed silly fraud like this? yet Kaiser denies that any digital records were saved. three different sets were printed out. See #10 below for proof. See the full story, including Dr. Rhee emails.